I vividly recall the excitement when the distinctive ‘clunk’ of the Telex Machine (Google it!) starting to warm up. We would run to the Telex Room to watch this iconic machine type by itself – before our very eyes – and then roll the paper up to reveal the full message. We would read it – written in half English and half what seemed to be the language of a people from another galaxy – just to read it, because it was simply fascinating. And we marveled that this message had been sent from someone not from a different galaxy, but certainly from another country or another hemisphere, sending us, guess what…..a Reservation! We did this every time we heard that unmistakable ‘clunk’ of the Telex machine; too young and innocent at the time to know that this was just the beginning of Global Distribution (and the new competitive marketplace that came with it) and the beginning of continuous significant technological advancements in the hospitality industry. These technological enhancements changed the way we communicated, marketed, and streamlined the way we operated in order to provide better guest service and better financial performance. As long as you were using these new technologies, of course, because if you weren’t, you were no longer competitive. The Virgin Hotels Chicago merges old-world charm with the modern technology thanks to seamless self check-in terminals placed at the building original 1920s cigar bar. And so evolved the customer as well. Benefitting from choices in how they search and book, and being able to customize their experience, they have pushed us to up the ante at every turn. And then enter Generation X and the Millennial generation (who will have to Google “telex machine”) who are a naturally demanding customer base, making up a significant proportion of the travelling population. It’s really not about us providing systems that are better for them anymore, it’s about us living up to their expectations. They’re driving the technology revolution now and we have to keep up. For this very reason, IT costs in hotels have increased significantly over recent years, because of the need to at least be current, if not being an industry leader in technology. This has even changed the landscape of construction costs and operating expenses. The expense of a traditional PBX phone system as a pre-opening capex expense is replaced with an operating budget allocation for enhancements of the Mobile App. The reduction of the cost of computers is offset by the number of devices needed for day-to-day operation, where virtually every employee is now using a mobile device to perform their job. Our view is that flexibility is key. We need to be nimble and be able to constantly upgrade and improve. Legacy IT systems are handcuffs; they roll out upgrades and updates based on their terms and their timing and what they want to bring to market. And at the end of the day, when they do roll out an update to a system every hotel using that system gets the same update, at the same time, so no-one actually has an advantage. In that environment, no-one is really on the leading edge. That’s why we work with vendor partners for systems where we have leverage to lead enhancements based on our needs and innovations and to roll them out more quickly, keeping us on the cutting edge of hotel technology for the benefit of our owners; being a disruptor and not a follower, because, well, that’s Virgin. It also enables us to negotiate more competitive pricing than those legacy systems because we work with vendors who are flexible, and are eager to have Virgin Hotels as their valued customer. With mobile devices as powerful as desktop computers, consumers are looking for new ways to interact with traditional hotel touch points. 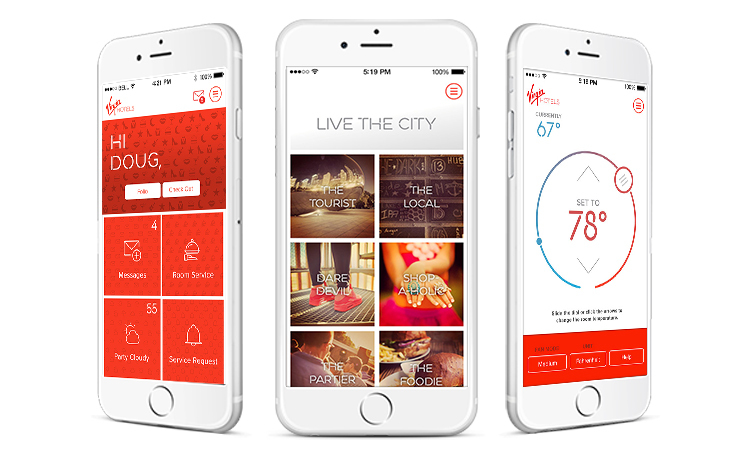 Lucy, the Virgin Hotels App, allows guests to control their stay from the palm of their hand — from preferences to payment. Just like how years ago we dropped everything to run over to watch the Telex machine print, these days we get bombarded by distractions on a daily basis. As I write this, I’m watching people wander past me fixated on their handheld mobile devices obviously trying to capture Pokemon characters. They’re totally focused on the task at hand and oblivious to what is happening around them. That’s not us. We’re always looking at what’s happening next, not just what’s happening now. Always looking at the big picture…even if it’s on a small screen.